When designing a brand logo, you want it to reflect the brand, its values. And you want it to reflect these values every time the brand logo is reproduced. So you think about form and color. And maybe, at the end, about printing that logo. Which is not ideal: you should think print from the start! I’ll explain why and how. If you are designing a brand logo, you should take into account ALL the possible uses for that brand. If the brand is a FMCG (fast moving consumer goods), it will probably be used on packages, in advertising. And that’s where it becomes interesting (or complicated, whichever you prefer). 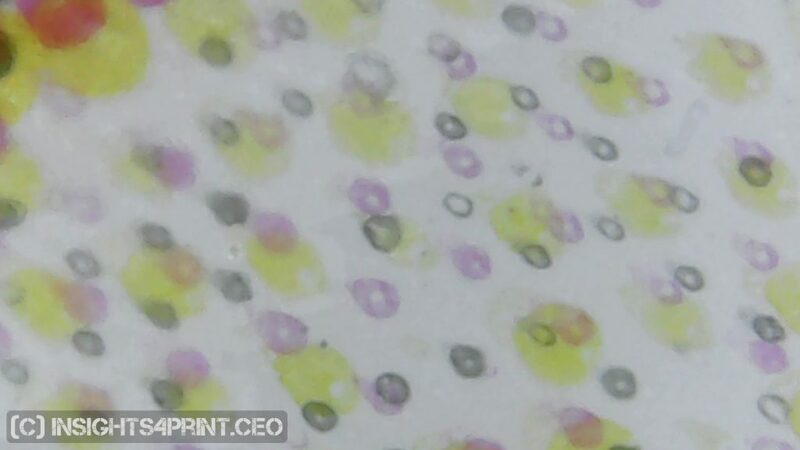 Not all substrates are equal, not all printing technologies are equal. A brown cardboard box is not the same as a glossy foil. A rather rough newspaper is not the same as a glossy coated magazine. And technology wise: a flexo press (e.g. cardboard packaging) is not the same as an offset press (e.g. brochures). In some cases you probably want to print the brand color(s) as a specific ink, a ‘spot color ink’. This is very common in packaging printing. You can even see it on the package: you will see to small squares or rectangles (‘control strips’) somewhere on the package that will show you the different inks used. This packaging was printed with two inks: a black one and a blue one. Some ‘spot colors’ are very hard to reproduce in CMYK, they will look quite different in that magazine ad. That is the reason why some colors are not used as brand colors. If you want to convert something (a photo, artwork in RGB, spot colors) to CMYK, we are talking about color management (in case you are not familiar with color management, please check this tutorial I wrote, specifically for brand owners and designers). As you probably know, you can use different ICC profiles for converting to the same destination, e.g. a coated paper. From a conceptual and mathematical perspective, they will all give you a ‘perfect’ conversion. In reality however, these can be slightly different and might behave different when being printed. The most pronounced example is a gray in RGB, e.g. R100 B100 G100. With one ICC profile (Coated FOGRA39) this will be converted into C 56%, M 46%, Y 45% and K 34%. With another ICC profile for the same type of paper (Coated FOGRA39L VIGC 260), this will be: C 35%, M 29%, Y 28% and K 57%. But, since it is a pure black, I could also – manually – choose to only use the K-channel in my artwork. A 75% K is the same color. And that will be much easier to print: you won’t get color shifts, which will be a risk with the other two conversions, since they use 4 channels (C, M, Y and K). So if you want to convert a spot color to CMYK, for that magazine ad, you can get different values with these different profiles. And now I hear you: “But there are CMYK values in the Pantone guide!” Yes, there are. But I would be cautious with a number of them… Remember the different substrates, the different printing techniques? Well, there are some things you shouldn’t do: e.g. printing a 1% of a color in flexo, directly on a cardboard box. Both substrates and printing techniques can have their limitations. You should take that into account. Printing is not a lab environment. It is not even an exact science, it’s not only pure math and algorithms. Print works with natural products, print depends on multiple variables, even including temperature of the print shop, the printing press. 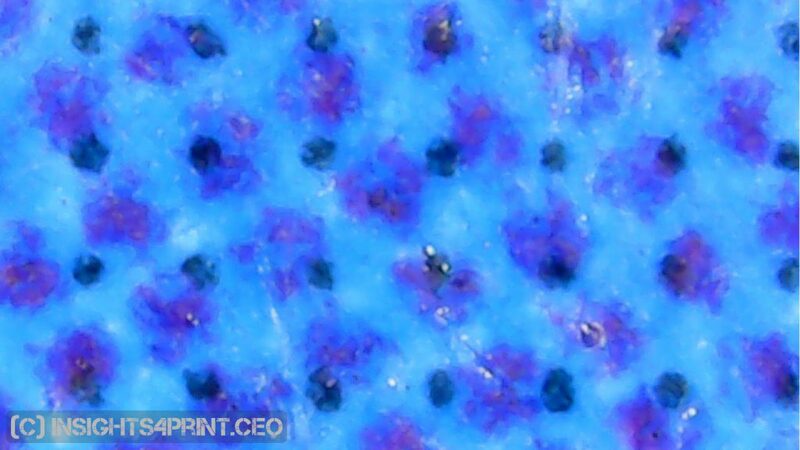 One of the properties of a print job that can change during printing, is ‘dot gain’. Which literally means that a printed dot becomes larger than the ‘ideal’, which you might have seen on computer screens. Or smaller, as dot gain can also be negative (dot loss). Let’s suppose you have a 1% of black in the CMYK version of your brand color, because it gives that little bit of extra twist on your screen compared to the 0% black. Well, chances are that the 1% will become darker than the 1%, even when printed on a coated paper with offset. And when it’s printed in flexo, on a cardboard box, it will probably disappear. The top half of this image has K0%, the bottom K1%. The dark lines are from a ruler, with a 1mm distance… Do you see how small these dots are? Imagine those small dots on a very rough paper, like a newspaper. Not only the small percentages are delicate, also the high percentages are: a 99% will probably become 100%. To be safe, you better avoid small and high percentages in a brand color conversion to CMYK. You better choose 0% for the ‘light’ colors and 100% for the dark colors. That 1 or 2% in offset, customers will barely notice the difference with 0% (ok, you and I, being experienced color viewers, we might see it, but the average shopper will not). When your brand colors will also be printed in flexo, you should check it with your print suppliers what the lowest safe percentage is. Not the best they can do in optimal conditions, but what the safe choice is. And stay above this (in highlights) / below this (dark areas) when designing your art work. And yes: these percentages are also relevant for spot colors, not only converted colors! 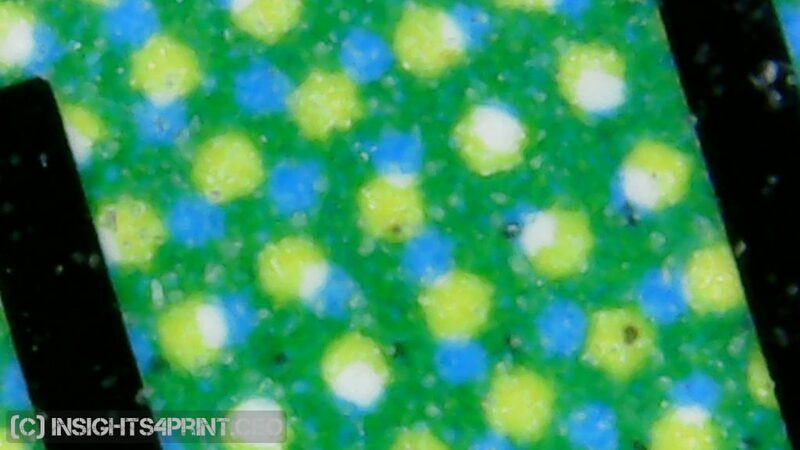 Another property that can change during printing, is the ‘density’ of the inks, which relates to a thicker or thinner layer of ink. This will mainly result in changes in chroma and/or lightness, to a lesser extent in hue. I admit, the following might be a personal thing… To me, a converted color with a small % in some of the channels, always looks ‘dirty’ to me… It seems there is something wrong. An office supplies company that sends me a folder on a regular basis, is a champion in that… Just last week I got a folder promoting their ink and toner deals, with large areas of C, M and Y. But they didn’t look ‘clean’ to me, so I checked it with a loupe and yes, the Y also had really small dots of C, M and K… And it was the same for C and M. Here there might be an ICC-based color conversion in play. Below are two more pictures from real print jobs. The first is from a large sporting goods retailer, which has the following blue as brand color: C95, M45, Y5, K0. The second is from an online retailer, also with a kind of blue as brand color: C100, M30, Y0, K6. You can see what these look like in real life. This is the corporate color of a large sporting goods retailer. It consists of C95, M45, Y5, K0. This is what it looks like when printed. So here is the choice you have to make: do you want to have the closest colorimetric match to the ideal color, a color where machines tells you which is the best match? Or do you want a ‘clean’ color (no small percentages), which might have a larger color differences when measured, but which is more pleasing? To me it is clear: I want a pleasing color for my brand! Not a dirty one, which would reflect on my brand image. But there are people who have an unconditional faith in algorithms. Just as a comparison: if your GPS/navigation system tells you to make a U-turn in the middle of the highway, do you obey without thinking? Or do you trust your eyes and wait to make the U-turn until the next exit? Seeing is believing. A pleasing color is better than a ‘correct’ color. Now I have to admit: I used to have that unconditional faith… But over the years I saw examples and situations where it did not work properly. Which changed my view: in some situations, you need to take another road to get the best, most consistent results. If you can limit the number of channels used in the CMYK conversion, e.g. 3 instead of 4, this will make print production in real life easier and more consistent. With 4 channels (C, M, Y and K), small differences in the 4 different channels can get amplified, showing an undesired color shift. Therefor: 3 is better than 4, 2 is better than 3. If possible of course. In a number of cases when you see a spot color conversion with 4 channels, it will have a small percentage in one of them. Is that really necessary? Can’t you get (more or less) the same color with 3 channels? When the small percentage is C, or M or Y, eliminate it and deduct that number from the other two and add it to K, you will end up pretty close. A little more tweaking might do the work. If the small percentage is K, then add that number to C and M and Y and you will again be pretty close. Once again some tweaking and you will get a color that will be easier to reproduce. This image shows how you can reduce the number of channels. The original color (left half) is C90, M5, Y50, K20 (ICC profile used: Coated FOGRA39). If you deduct 5 from C, M, Y and add 5 to K you will get the color top right, which is already quite close. After a bit of tweaking (which took me less than 5 minutes! ), I got C88, M0, Y48, K25 (bottom right), which will be indistinguishable in print from the original color. But it will be more stable in print, so less changes on color deviations. When you are evaluating multiple candidates for the brand colors, get them printed. Not a proof, a real print. In both offset and digital. This isn’t that expensive anymore: go to one of the online print shops and check the prizes for e.g. flyers. Make multiple variations of the ‘optimized’ spot color conversions on one page and get that overview printed. Use the same file for both digital and offset. 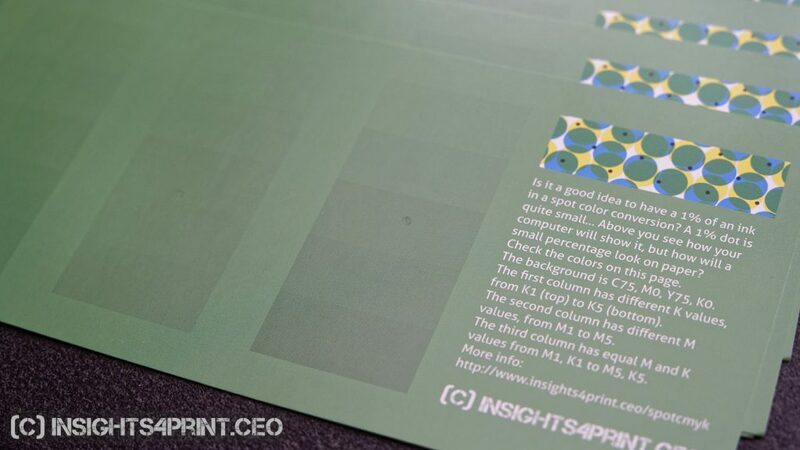 Then you can check the colors ‘in real life’, the way they will be printed, not just on your screen. This is the flyer I designed and got printed. 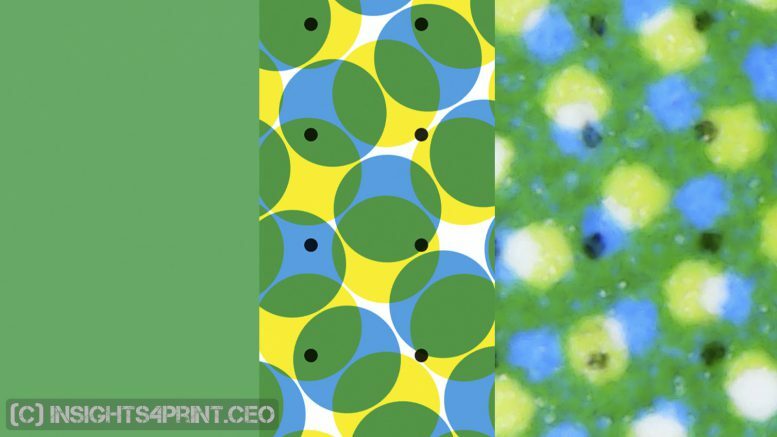 It contains multiple variations of the green, with growing percentages K and M.
Design in CMYK! Exchange those ASE files! Now that you have found the best CMYK conversion for your brand color, you’re almost ready for real production. But first a really important point that will make your life a lot easier: create custom swatches for use in the Adobe Creative Cloud applications (do this in CMYK Color Mode, not RGB Color Mode!). And save these, as an ASE file, so that you can exchange them with others. And do exchange them, with everybody who is designing for that brand. It will improve consistency in design, and therefore in production. And, if necessary, instruct others how to use these swatches, how to design for the brand. The video below, from Lynda.com, shows how you can create those ASE files. Please note that they are creating the colors in RGB Color Mode, for our purposes, you need to use the CMYK Color Mode! Otherwise the colors will be converted with color management and you might get those low percentages we are trying to avoid… If necessary, make two different color swatches, one for web use, one for print use. BTW: if you need help with this kind of issues, you can contact me via the contact form. do you have an unconditional faith in algorithms and technology? Or do you trust your eyes? do you design for the best print shops in town, with state of the art equipment (e.g. HD Flexo) and excellent standardized procedures? Or do you play it safe and make sure your design can be printed by print shops that do not offer that kind of quality level, consistency and standardization? If you want to play it safe, my approach probably will deliver less issues with color consistency, so less arguments, less irritation and less reprints (which is also a plus from an ecological point of view). But again: some people might disagree. And for the record: I can’t be held responsible for any deviations in print jobs which are executed to the tips in this article. 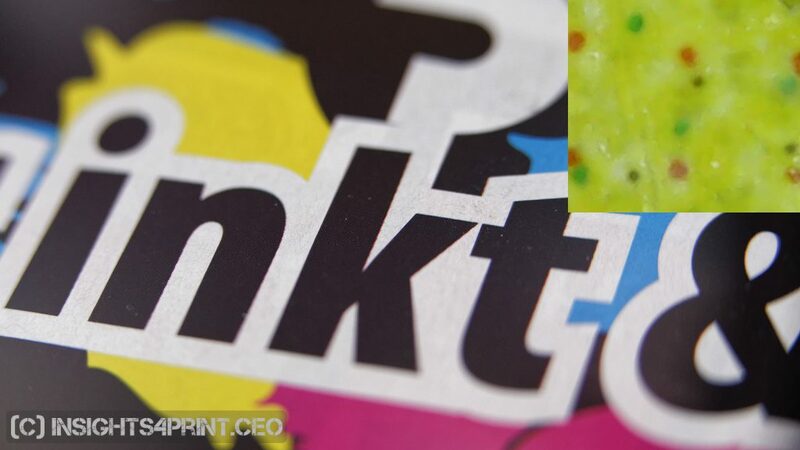 4 Comments on "Brand colors and printing in CMYK: better safe than sorry"
Hi Fero, happy you like the article! This article was a great help to get clear some concepts of printing. I am new to printing world, before that i used to make graphics for web only. But had started learning and experimenting on printing colours since last 6 months. Working in illustrator it is very difficult to find difference in spot colours and process colours. My brand colour has only 2 channels : C99, M0, Y70, K0. but to get the printed colour nearer to Pantone 334C have to use C86, M16, Y64, K02 which works quite well. This made me think about adding little percentages to all clean channel would give better result then using lesser channels, but i am not sure of it though. Thanks for your comment Angira! In Adobe Illustrator (and Photoshop, InDesign, …) you won’t see any difference between spot colors and the simulation of that spot color in cmyk (on condition that it can be reproduced in cmyk). 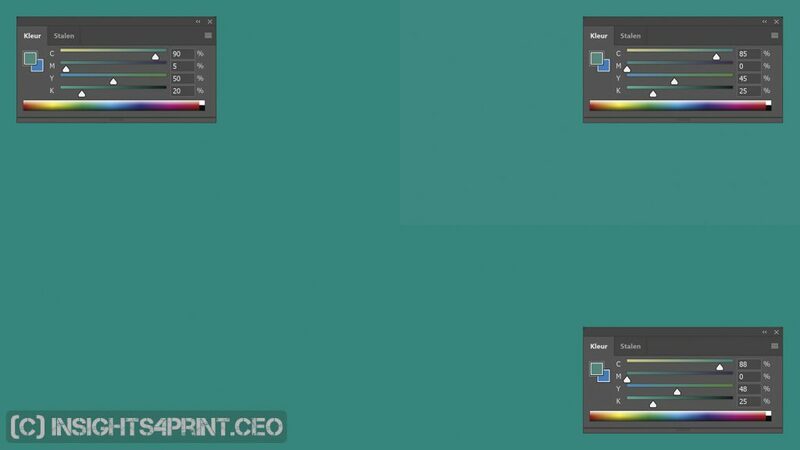 The two cmyk values you mention, they look rather different (also the visual appearance when I check them in Photoshop). The one with only two channels looks very ‘pure’ and vibrant, the other looks darker and dirtier. And how did you compare these values with the Pantone 334C reference color? Was this on your screen? Was this printed on an small printer? Or was this printed in offset? And was this just one print job or multiple print jobs? Because that is the idea behind this article: with those ‘simple’ simulations (using as few channels as possible), different print jobs (e.g. a few dozen) will be much more consistent. 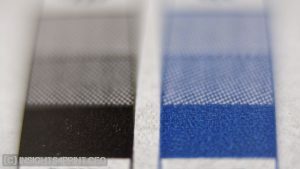 Depending on your budget, you could check this by ordering a small print job with both colors (e.g. a postcard in the smallest amount possible for offset printing) at five or ten different online print shops. You will probably see that the simple one looks rather consistent, the one with the four channels might look very different. Adding small percentages to clean channels is not a good idea in my opinion: it will make the color less stable in printing. 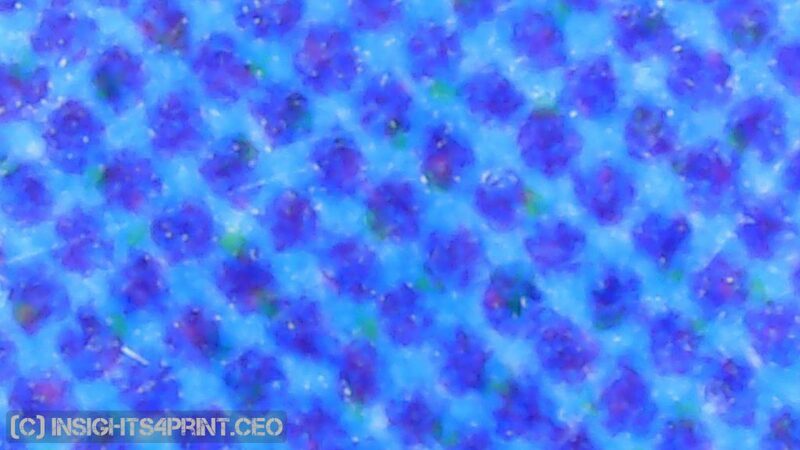 When comparing different print jobs with that color, you will get different colors.